Solar water heating was chosen since it allows storage of solar energy harvested in daylight for use at nighttime or in a different time of year. This extends the added value of the sun and makes solar solutions even more profitable. The Silkeborg plant is designed to produce 80,000 MWh of heat annually, and at the same time reduce annual CO2 emissions by 15,700 tonnes. The solar hot water system runs on SONDEX® heat exchangers and VLT® drives, which have powered a 30% cost reduction in its first year of operation, compared with traditional drive systems. Four large pumps run continually to distribute the hot water to consumers. In addition, four more are available on standby as backup. All eight water pumps are controlled by VLT® AQUA drives to maintain their energy consumption at an absolute minimum. 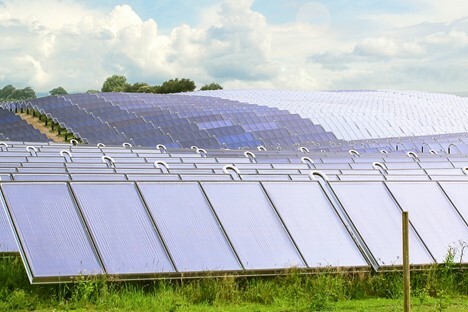 A total of four heat exchangers delivered by SONDEX® are connected to the solar heating plant. The model is named S221 and has between 884 and 936 plates. At the utility in Silkeborg, the buildings are adapted to the size of the heat exchangers. They are specifically designed for the customer due to the effect and the height difference of the landscape. The Silkeborg solar water heating plant contains 22 km of piping which links together 12,436 solar heating panels, equivalent to the area of 20 soccer fields. The panels are installed over an area of 50 hectares, comparable to 60 soccer fields. The park is built in four independent sections, to ensure maximum operating reliability. If an operating problem arises in one field, the operators isolate it and then run on the other three. The plant is designed for a lifetime of 25 years. It is a highly efficient plant, which is 4-6 times more effective than residential solar water heating systems installed typically on rooftops of private homes. As the price of high Global Warming Potential (GWP) refrigerants increases and regulations become tougher, Danfoss is continuing its Refrigerant Week initiative to help industry professionals and decision-makers make the transition to lower-GWP refrigerants. Refrigerant Week, an official affiliate of Climate Week NYC, will take place from September 24th to 28th and feature webinars, tools, resources, and local events aimed at promoting and enabling lower-GWP solutions. The world’s largest solar hot water system harnesses energy to heat the homes and workplaces of 40,000 citizens. It supplies 18-20% of the annual heat consumption in the city of Silkeborg, Denmark, which has an ambitious target of CO2 neutrality in heat production by the year 2030.